This entry was posted in News & Views, Quotes and tagged BLOTUS, conflicts, distraction, media, tweets on October 21, 2017 by Ray Buchanan. 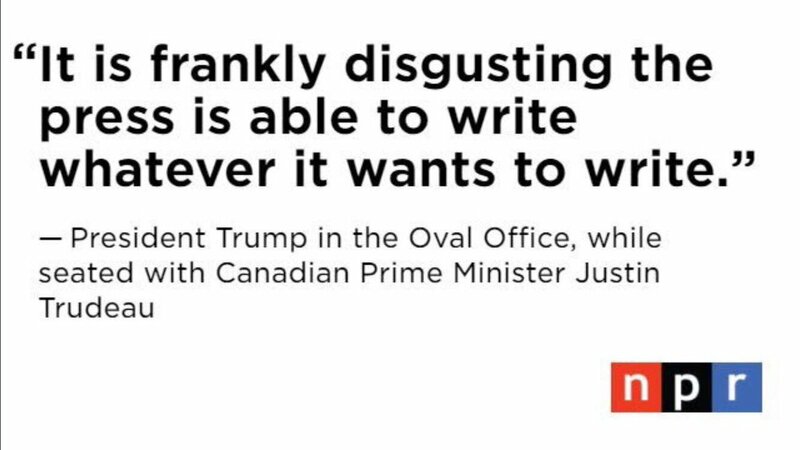 What is actually frankly disgusting is that the United States has a leader so ignorant of history, and so morally bankrupt that he cannot comprehend that a free press is one of the bulwarks of a democratic society. We need more investigative reporting, not less. What is actually frankly disgusting is that Congress refuses to act to remove this incompetent and dangerous moron from office he holds. History will condemn their failure to act as a complete betrayal of the public trust. The press needs to hold Conress accountable. The press needs to “double down” on their scrutiny of the #BLOTUS to ensure the entire world knows what a greedy, racist dotard he truly is. As long as the #BLOTUS is in the White House, we need to rename his space. It’s no longer the Oval Office. It has officially become the Offal Office. This entry was posted in Facts & Statistics, News & Views, Quotes and tagged accountability, betrayal, BLOTUS, Canada, Congress, dotard, free press, greed, history, impeachment, Justin Trudeau, media, moron, NPR, Offal Office, oval office, Prime Minister, public trust, racist, reporting, scrutiny on October 12, 2017 by Ray Buchanan. I have never been a big fan of David Letterman. But, that said, he nailed it with this comment. We have never seen a more corrupt leader in the White House. We have never, at least in my lifetime, seen a president that has demonstrated such incompetence, ignorance and blatant disregard for the Constitution. We have never seen a president that consistently lies, attacks the media, or creates such discord and divisiveness. And this is on top of all of us realizing the absolute strangle hold that Putin has on the Lord of the Lies. This presidency will go down as the worst in our history, It cannot end soon enough. And, as Letterman stated, it’s time to stand up and demand he be held accountable. Enough is enough. Mueller cannot move fast enough. This entry was posted in News & Views, Quotes, Uncategorized and tagged "Lord of the Lies", action, BLOTUS, cable shows, constitution, Dairy Queen, DAvid Letterman, discord, divisiveness, goon, history, ignorance, impeachment, incompetence, lie, media, presidency, press, Putin, Robert Mueller, victimnization, whining on September 25, 2017 by Ray Buchanan. It’s not fake news that dictators and totalitarian leaders throughout history have recognized the need to silence those who tell the truth. An honest media always poses the biggest threat to those who would misuse power. The first step in controlling that media is to discredit it. I find it fascinating that we never heard of fake news until we got a fake leader. Coincidence? I think not. Who are we to believe? The Liar-in-Chief is pathologically unable to tell the truth and changes his story every other day in spite of video evidence to the contrary. On the other side is the free press. As for me, I am sticking with, and standing up for a free press. 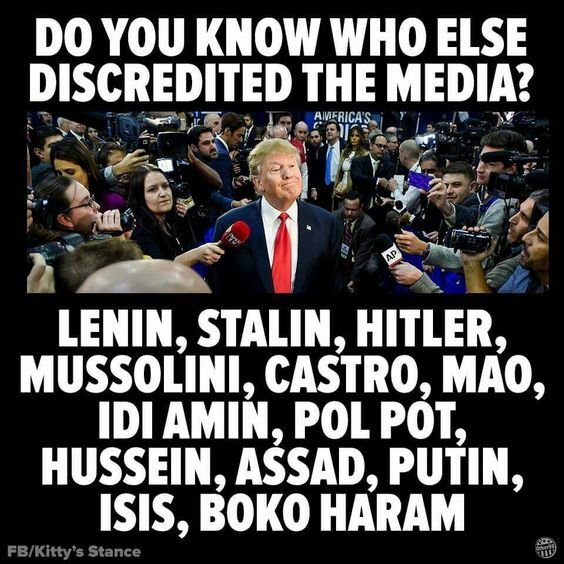 Their credibility has stood the test of time, and a free press is our best defense available against scoundrels, thieves and dictators like all those listed above. And right now, we need the best defense we can get. This entry was posted in Facts & Statistics, News & Views and tagged Assad, BLOTUS, Boko Haram, Casto, dictators, discrediting, fake news, Hilter, Hussien, Idi Amin, ISIS, Lenin, Mao, media, Mussolini, Pol Pot, press, Putin, silence, Stalin, threat, truth on August 26, 2017 by Ray Buchanan. 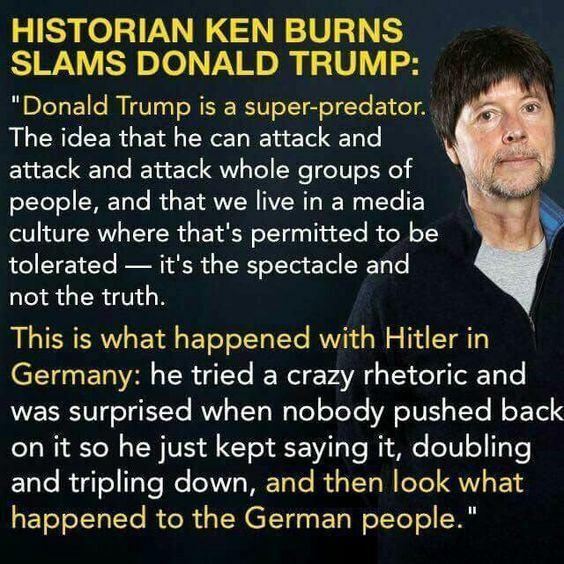 This entry was posted in Facts & Statistics, News & Views, Quotes and tagged BLOTUS, crazy rhetoric, culture, Donald Trump, facts, Germany, Hilter, history, Ken Burns, lesson, media, quote, spectacle, super-predator, truth on May 19, 2017 by Ray Buchanan. We are known by the company we keep. At least that’s what my mom always told me. This morning, I just saw Russian agents meeting with the #BLOTUS in the White House. This is one day after firing the head of the FBI who was investigating his treasonous ties to Russia. From the photos I could not tell who had the biggest smiles. The #BLOTUS was definitely enjoying hosting his friends. What is blatantly obvious, however, is that the current leader of our nation is far more comfortable with dictators, thugs, and strongmen than he is with the rule of law and the dictates of the Constitution. The #BLOTUS covets absolute power. Anyone with the courage to challenge that power will be eliminated. FBI Director Comey wasn’t the first to feel his ire, and sadly will not be the last. This entry was posted in Facts & Statistics, News & Views, Quotes and tagged absolute power, Assad, BLOTUS, Boko Haram, Castro, Comey, constitution, dictators, FBI, free press, Hilter, Hussein, Idi Amin, ISIS, Lenin, Mao, media, Mussolini, Pol Pot, Putin, rule of law, Russian agents., Stalin, thugs, treason on May 11, 2017 by Ray Buchanan. The person now leading our nation has been in court over 3,000 times. Yet, he was still thought ethical enough and intelligent enough to lead our nation. That explains a lot, doesn’t it. The majority just seems not to care about traditional American values like honesty, truthfulness, and caring for the other person. So now we have a egotistical braggart who lives by the lie doing his best to destroy our country. The lies of #BLOTUS caught up with him enough so that he was taken to court over 3,000 times. Who will hold him accountable now? We no longer have a president we can respect. We have a president we need to fear. This entry was posted in Facts & Statistics, News & Views, Quotes and tagged accountabilty, BLOTUS, braggart, casinos, contract disputes, country, courts, ego, ethics, fear, golf courses, honesty, intelligence, law, liar, libel, licensing, lying, media, Miss Universe, nation, personal injury, President, realestate disputes, slander, taxes, Trump, truth on February 22, 2017 by Ray Buchanan. What is newsworthy? It’s far more than a philosophical question for me. I took Journalism 101 before the turn of the century, and I have been working with journalists and reporters most of my adult life. I am also always actively seeking publicity for the various nonprofit organizations I work with and of which I am a part. I am comfortable with the media. 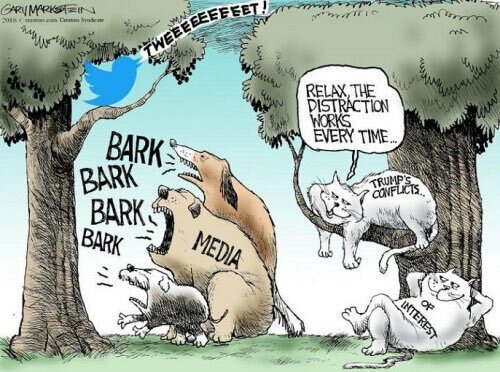 I know a little about what is news and what isn’t. One of the first adages we were taught in my journalism class was that “if it doesn’t bleed it doesn’t lead.” Some things never change. Every since the collapse last month of the garment factory in Bangladesh, the news of this particular tragedy has been close to continuous. It is newsworthy. Over 1125 people lost their lives. That is definitely news. What bothers me is that the media coverage of that singular event continues after almost a full month. Over 1125 people died in a tragic accident. That’s news. I understand that. But, during this media feeding frenzy and shark-like ripping at the carcass of that story, over 25,000 of our family have been needlessly dying from hunger related causes every single day. That’s over 750,000 unnecessary deaths in the month since the Bangladesh building collapse. Yet, I can find no coverage of these deaths. Where is the media coverage for the victims of hunger? Why isn’t the unnecessary deaths of these innocents newsworthy? “If it doesn’t bleed it doesn’t lead.” Maybe the victims of hunger are dying too quietly. They just need to bleed more. Or maybe the world just doesn’t give a damn about the poorest of the poor. It’s obvious that the media doesn’t. The hungry just are not newsworthy, even in death. If we ever get serious about ending the moral obscenity of hunger in a world of plenty this will have to change. This entry was posted in Facts & Statistics, Hunger & Poverty, News & Views, Quotes and tagged Bangladesh building collapse, blood, death, hunger, journalism, media, morality, news, newsworthy, nonprofits, obscenity, philosophy, poor, poverty, shark, tragedy on May 13, 2013 by Ray Buchanan.